Fall is quickly approaching which means pumpkin flavor is about to be everywhere. 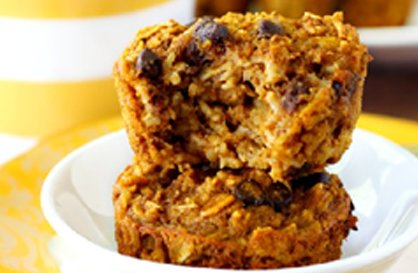 These baked pumpkin oatmeal muffins combine the ease of food prepping with the joy of pumpkin spice flavor. Make these in advance for an easy to grab and go snack or pair 2 muffins with some Greek yogurt for a yummy breakfast packed full of protein and complex carbs. Each muffin has about 20gm of carbohydrates and 3gm protein. 1. Preheat oven to 350 degrees F. Spray muffin pan with non-stick cooking spray. In a large bowl, stir together oats, baking powder, seasonings and salt. 2. Add pumpkin, egg, maple syrup (or honey), vanilla extract, milk and add-ins. Stir well to incorporate. 3. Allow the mixture to set and thicken for about 3-5 minutes before spooning into your muffin pan. 4. Fill muffin cups almost completely full with batter. The muffins will not rise. 5. Bake for 30 minutes and until the center of each oatmeal muffin is set. Be sure to allow muffins to cool for 10 minutes before removing from pan and serving. If not allowed to cool muffins may fall apart. Try using a knife around the sides to make removal easier. Store in a covered container in the fridge for about a week or freeze for up to 3 months.